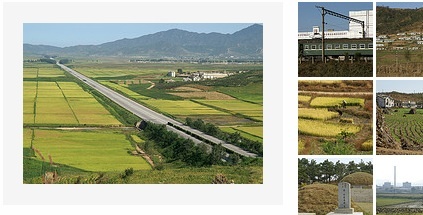 Stray Blog has written about his visit to North Korea's Kaesong City. His was one of the last tours before North Korea put a stop to cross-border travel . Stray Blog writes that the North Korean are disadvantaging themselves  by this action. My visit to Kaesong City, North Korea last weekend was timely. This week, relations between North and South Korea took a turn for the worse, and the North responded by canceling any cross-border movement. The unfortunate aspect of this decision is that the overpriced tours made a great deal of revenue for the people of the North. Canceling them is really just a further punishment on North Koreans themselves, who are already struggling to combat a debilitating food shortage. I was fortunate to be able to take one of the last tours of the North for potentially a long time. Visitors to the country are struck by the lack of advertisement banners and colour as Stray blog observes. Flickr user Kernbeisser has posted images of his earlier journey along the Pyongyang-Hyangsan motorway . North Korea Economy Watch announces the launch of the website  of the Pyongyang University of Science and Technology (website link ). On the website the founder Dr. james Chin-Kyung Kim writes about the motivation behind the institution. In North Korea, you will find people wearning pins (badges) featuring Kim jong Il and Kim Il Sung. These pins are coveted by foreign tourists and hard to get if you are not a North Korean citizen. the bloggers Lianlian Films managed to get one while in North Korea. They describe how they hold the pin in reverence  even when they are abroad. At the Pyongyang Restaurant  in Kathmandu, a North Korean waitresses squealed when shown The Pin – they don't normally wear one in Nepal. The young lady picked it up very carefully, whipped out a piece of tissue and polished the little disc to a shine. Then she took out another piece of tissue and wrapped it up before giving it back. All throughout, she barely spoke a word but the message was clear – The Pin is sacred. Treat with care. Talking about the North Korean restaurants, there are several of these across East Asia and are official North Korean investments. In addition to the food, a big attraction of these restaurants are the singing and dancing North Korean staff.